This is a 4-minute recording of the dawn chorus in Cromwell Lane. The chorus begins at about 5am (GMT) and lasts for about 45 minutes. 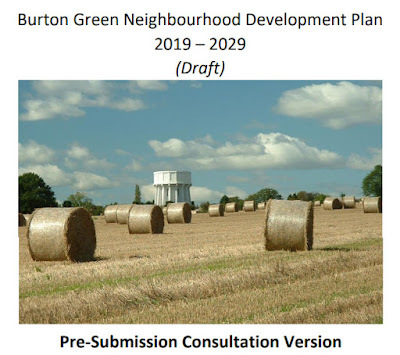 Please note that the iconic image of Burton Green on the cover of the Neighbourhood Plan (see above) shows a field adjacent to Westwood Heath Road, that is about to be covered by a housing estate! A Community Meeting will be held on Sunday 24th March in the Village Hall, 10.00am to 1.00pm with coffee and refreshments included. We hope you are able to take part in this event because we need to know what’s good about what has been done on the Neighbourhood Plan so far and what could be better. 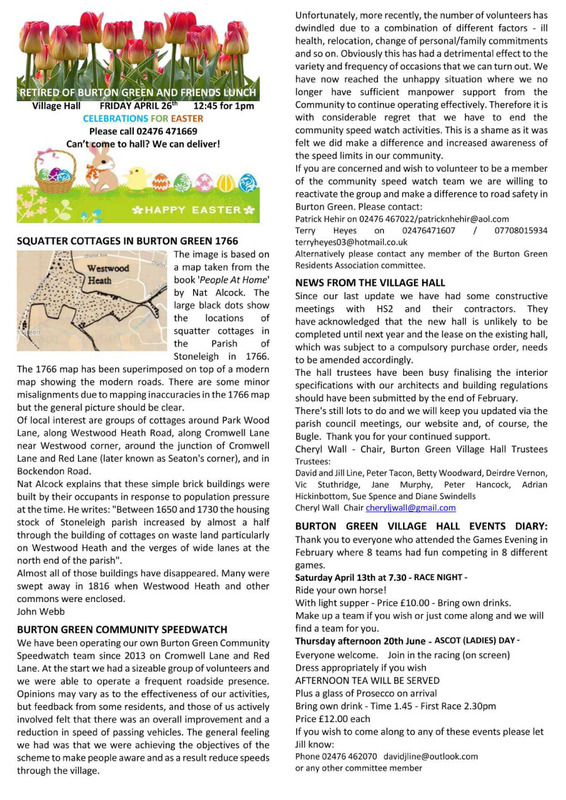 We have to be able to demonstrate that our Plan has been developed in response to the input of Burton Green residents so your views really do matter. Please come along to the Village Hall on the 24th March and make a difference. Dianne Adams; Hilary Cox; Paddy Deeley; Andy Gibbs; Judi Hibberd; Janet Hickinbottom; Bron Putnam; Rona Taylor; and Faith Ward. Apologies had been received from Helen Hehir and Mary Webb. The committee was pleased to hear of Mary’s successful hip replacement. The minutes of the January 23rd meeting were approved. Hodgett’s Lane overgrown hedge – Rona would try again to contact the residents concerned. Treasurer’s report had been re-sent. Fiona is the Rural Capacity Officer working for Warwickshire Community Voluntary Action. CAVA provides a single point of access for everyone who wants to engage in community and voluntary action. Fiona explained her work tackling rural isolation. The group can provide signposting to potential funding and tackles issues such as internet and telephone scams, safeguarding and governance. She was thanked for attending and providing information. A report had been circulated. Dianne explained the items. There were no questions. Cala Homes – is there a site office yet? Paddy agreed to continue to liaise with the site manager who was always very helpful. Rubbish dumped in the ditch outside the site would be removed by Cala Homes even though it had not come from the site. There had been some complaints regarding water from the site puddling on Red Lane. It was agreed this needed to be monitored but that the situation was likely to improve as site development reached a conclusion. Nearby residents had complained about lights being left on all night in some of the properties. Cala Homes had been approached about this and explained it was their security policy. Once site security was established it was hoped the lights could be extinguished. Lorries were travelling past the school in Hob Lane and presented a danger, especially at each end of the school day when there was always congestion on the narrow lane. Cala Homes could not force delivery lorries to use other routes as that had not been included in the planning permission, but they had ordered signs recommending a different route. Lunch for retired and friends of BG, April 26th .This was being arranged. Volunteers to assist were always welcome. Further publicity of the event would be circulated on the loop. Report from Waste Partnership conference. Rona had attended and reported back on some of the presentations with a focus on recycling and using “waste” food. She said it was an annual event and would be worth attending every year. Report from Kenilworth Forum, March 5th Thanks to residents’ votes, there would be 10 police speedwatch sessions on Cromwell Lane. Walking for Health was another project to tackle isolation and bowls sessions at Castle Farm were also highlighted. A grant had also been given to the Kenilworth Greenway group that oversees the Kenilworth end of the Greenway. Rona had attended the Balsall Common presentation evening. The £500 collected by the Santa Sleigh in Burton Green was presented to our chosen charity Canley Community Centre with an additional £100 from the Lions. This was gratefully received by the Centre representative who explained some of their work especially with children in the area. The overgrown hedge on Cromwell Lane near the Greenway. Rona agreed to visit the householders. 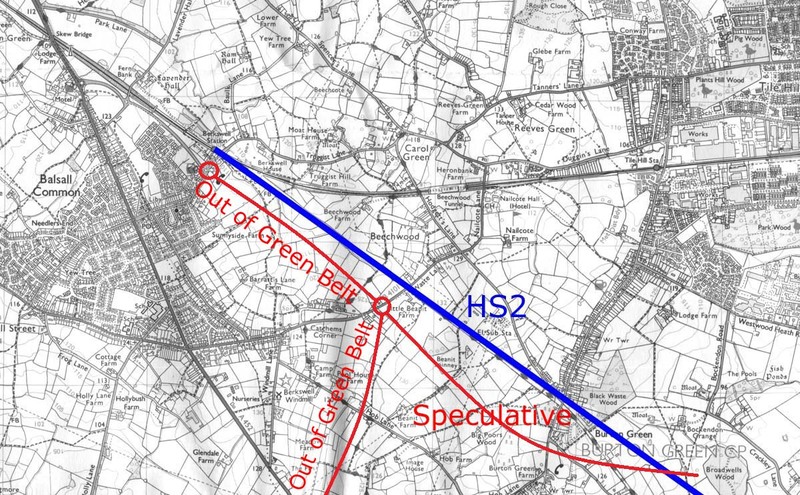 Roadworks which probably had little communication between HS2 and various services. 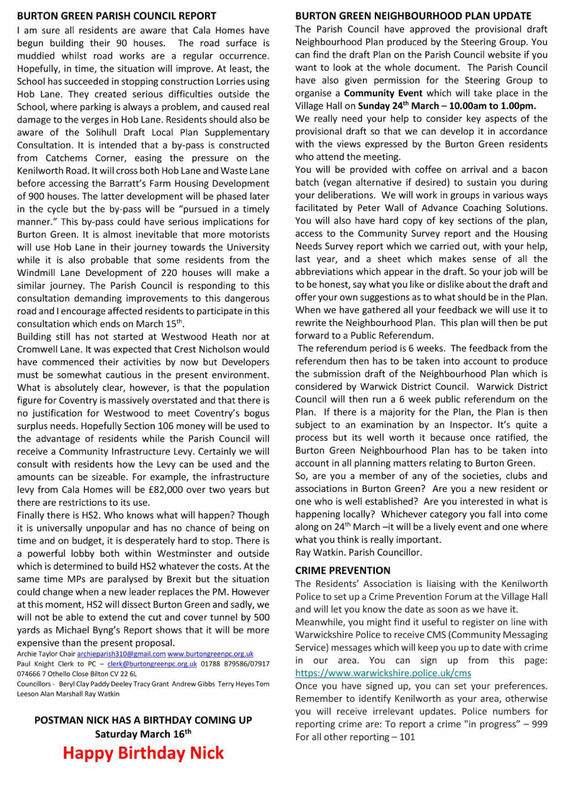 A resident’s letter highlighting the problems to HS2 had been copied to BGRA. Crime Prevention – Mary was liaising with our community police to arrange a meeting on Sunday June 9th. Bus timetable – slight amendments to the bus services were not displayed at the bus stops. WCC were responsible for this and had been informed. New timetables had been distributed with the recent edition of the Bugle. A date of the end of 2020 was still anticipated as the date for the completion of a new hall. There was nothing more to report. There was nothing further to report. The committee wished to thank John Webb for his continued support in the research and production of interesting articles for the Bugle and for maintaining such an excellent website for Burton Green. 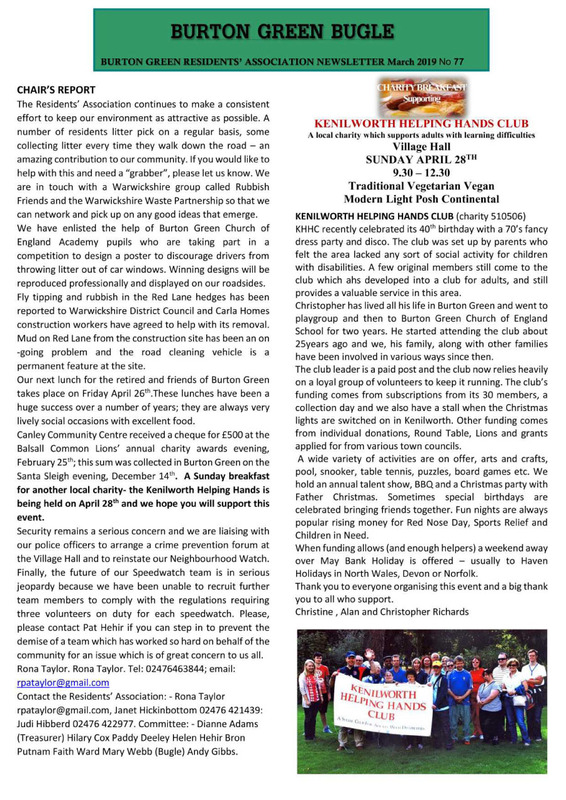 The March 2019 edition of the Bugle has been published. The text of the Chair's Report has also been added to the Residents' Association page. Regrettably, the route options for the proposed new road are still being kept secret by local authorities and our elected councillors are colluding with that secrecy. Councillors have the authority to mandate full publication, overriding council officers. None the less, it is intended to proceed with phase one of this proposal i.e the creation of another bridge over the A46 at Stoneleigh to create a roundabout junction. Some preliminary work clearing woodland has already been undertaken. Going ahead with “phase 1” when there is no clarification of “phase 2” and “phase 3” of the road, is at best premature. And in fact, even the phase one proposal does not have the full planning permission approval required from the Department for Transport. A previous application to the DfT for that permission by Warwickshire County Council triggered a number of objections sent to the DfT. This triggered the announcement of a public enquiry. But, in response, that application was withdrawn by the council and the whole process has been started again. Previous objections have not been carried over. So there is only until midnight Monday 18th February to get new objections in to the Department for Transport. The A46 Link Road is not a proposal of any Local Plan now in force in the areas it would run through. It is not shown on any public Proposals Map or Policies Map. The A46 Link Road would be highly damaging to the countryside south and west of Coventry, which is in the Green Belt. 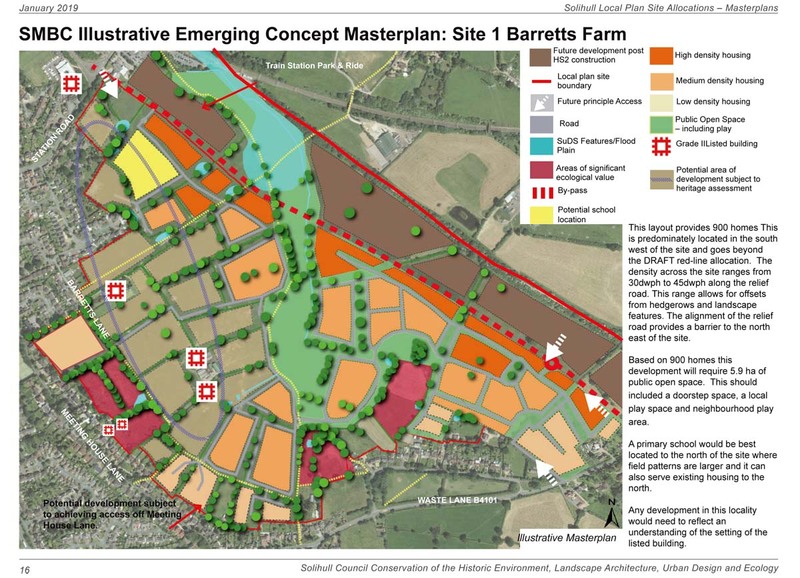 It would enable release of land for development which is currently agricultural land, woodland or available for recreation. The established pattern of urban areas surrounded by Green Belt would be undermined and eventually lost. The need for the A46 Link Road has not been shown; it appears to be promoted for development purposes rather than to meet any problem on the present road system. The existing main roads, A46, A45, and A452 have provided sufficient access and linkage for the present level of development and there is no current public pressure or demand for further road capacity. They have congestion at peak hours inevitably, but operate freely off-peak and at weekends; peak hour delays are not grounds for new road-building when tested against national transport policy to encourage use of other modes of transport. There has been no public consultation on the A46 Link Road, and no date for such consultation has been announced. Phase 1 has now been promoted by Highways Act Orders ahead of consultation on the proposed road as a whole. 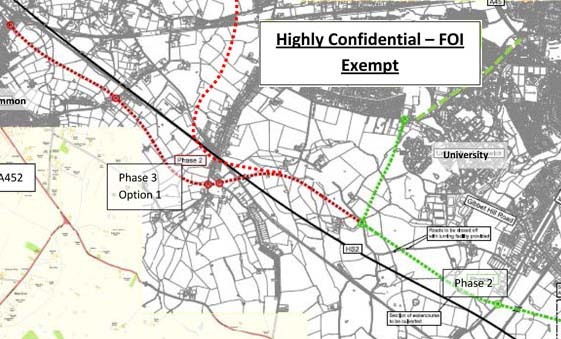 These Orders are the first opportunity those affected by or concerned about the A46 Link Road have to give their views on it or to lodge objections. While a planning permission for the Stoneleigh Junction enlargement has been granted by Warwickshire County Council to itself under deemed-permission regulations, that did not involve any independent appraisal or right to an independent hearing and does not restrict scope for objections to these Orders. 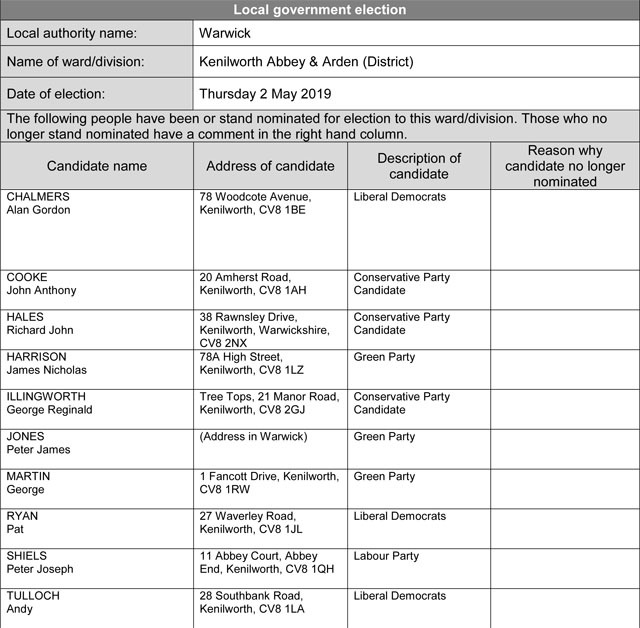 Warwickshire County Council should be asked to either bring forward the overall A46 Link Road proposal, or if they cannot do this to assent to these Orders been held in suspension until the full A46 Link Road is published and a public inquiry into the full proposal can be held. If not, a public inquiry into these Orders is requested. We will begin proceedings with a short Parish Council meeting at 7.00pm to 7.30pm. This will be followed by our Annual Parish meeting where the key topics of HS2, Housing, Roads/Traffic and the Neighbourhood Plan will be discussed and any other topics you wish to raise. The meeting is expected to finish by 9:00pm and it will be followed by wine and nibbles. 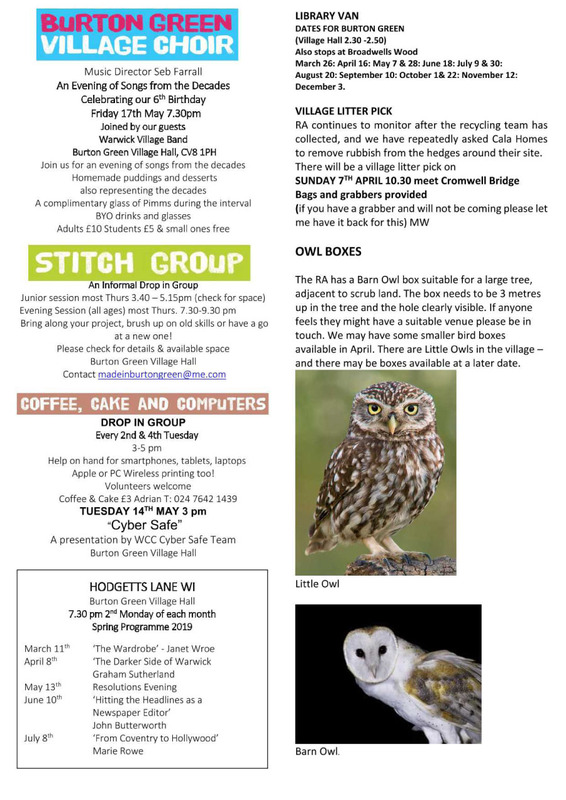 Tuesday 23rd April 3-5 pm (2nd and 4th Tuesday of each month). Come along for help with your technology questions or just for a chat. £3 to include drink and a cake.